The Stargate program has been shut down, but fearing that Daniel's warning of a Goa'uld attack could be true, SG-1 defies orders and takes one last trip through the gate to the point believed to be the origin of the attack. They find themselves on a Goa'uld pyramid ship headed for Earth and commanded by Klorel, the Goa'uld son of Apophis in the host body of Skaara. 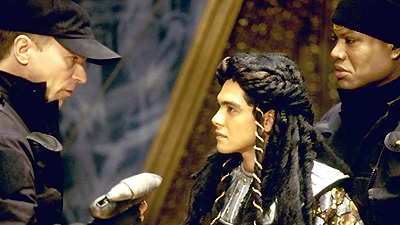 As Carter and Daniel wire the ship with explosives, O'Neill and Teal'c confront Klorel, hoping to reach Skaara instead. But O'Neill is forced to shoot Skaara, just as Earth comes into view. Part one of two. Hammond was one month away from retirement before taking command of the SGC. The coordinates from the P3R-233 transmission for the origin of the Goa'uld attack, were to a Goa'uld attack vessel in orbit. Once leaving orbit, the coordinates would not work because the point of origin was no longer valid. SG-2, under Major Ferretti, was to be sent to retrieve SG-1 from the unauthorized mission, officially for court martial. Klorel, the son of Apophis, is the Goa'uld symbiote inhabiting the host body of Skaara. A Goa'uld ha'tak vessel is capable of hyper-launch and can travel at 10 times the speed of light. Goa'uld long-range visual communications device is similar to a spherical television. Zat'nik'tel: Goa'uld weapon, known as a "zat gun" using a different form of energy from a staff weapon. One blast disables with great pain, two kills, three disintegrates. Teal'c is qualified to pilot a Goa'uld death glider. Cairn deep-space radar detected two large blips passing Saturn.